When you are writing you must assume that the next thing you put down belongs not for reasons of logic, good sense, or narrative development, but because you put it there…The adhesive force is your way of writing, not sensible connection. This seemed useful, as I often write poems by collecting images until I see a poem in them, meaning they don’t necessarily follow or tell the same story. This leads into the idea of using words for the sake of sound and ‘getting off the subject’, which Hugo suggests often gets in the way of actually writing the poem. Sometimes a connection can be made for meaning, even if the original choice of words was sound based. 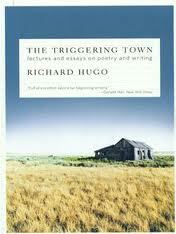 Hugo also talks about writing without the reader in mind. “There is no reader.” And we talked about this as a class. I think this is an especially hard thing to remember in the context of a workshop, as we are all aware that we do have an audience and we know exactly who that audience is! It’s very different from writing and thinking ‘maybe no one will ever read this’, which I admit is quite freeing.